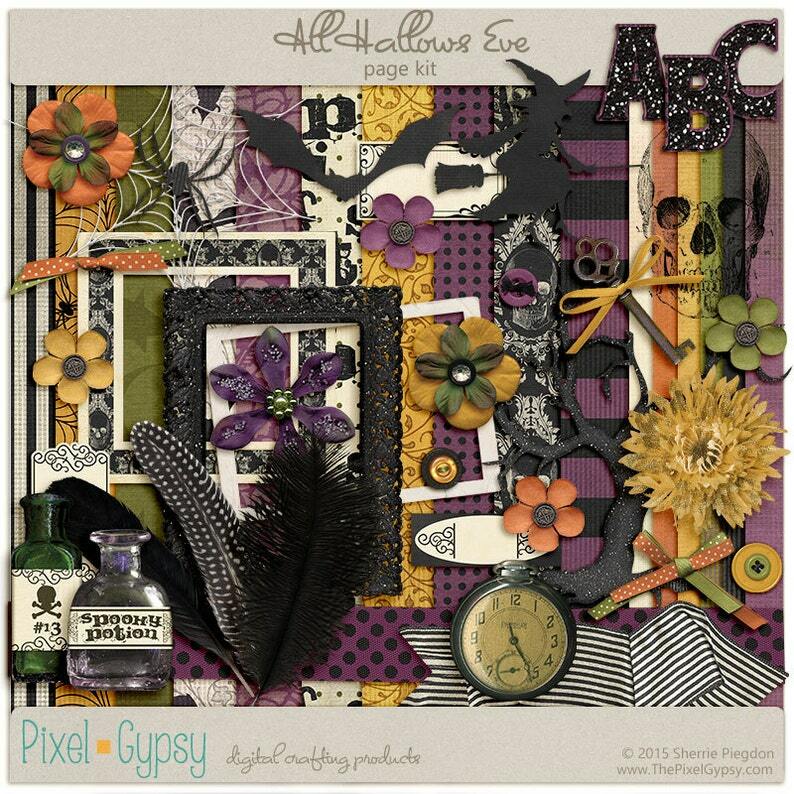 The All Hallow's Eve digital scrapbooking page kit is the perfect compliment for scrapping your favorite Halloween photos! What makes All Hallow's Eve special is that it was created with teens and adults in mind, so this is a great page kit for creating layouts of your older children or your grown up Halloween festivities, or even Halloween party invitations--but it can still be easily used for photos of your little trick or treaters, too! This product is being offered as an INSTANT DOWNLOAD. After payment, your product download links will be AUTOMATICALLY sent to by Etsy. **Note: If you don't receive your links within 5 mins of posted payment, please be sure to check your spam box. You can also access your downloads via the Purchases page. These letters worked perfect in our classroom! Love them! Due to the digital nature of the products, no refunds can be offered. All digital stamps offered for sale or free by Sherrie Piegdon and/or Pixel Gypsy are copyrighted by Sherrie Piegdon/Pixel Gypsy. No transfer of copyright occurs due to download, purchase or use of digital stamps created by Sherrie Piegdon/Pixel Gypsy. Purchasing digital stamps created by Sherrie Piegdon/Pixel Gypsy (or downloading free promotional stamps created by Sherrie Piegdon/Pixel Gypsy) grants you a standard-use license which is outlined below. *Use the digital stamps to create cards, scrapbook pages, photo books, and craft projects for your own personal enjoyment or to give as gifts. *Use the digital stamps to create handmade products for sale, without limitation on how many you sell in a calendar year. *Redistribute digital stamps in any way, whether for sale or free of charge, including but not limited to: offering the digital stamp for download on any website, including the digital stamp as part of any graphics collection, sharing a copy of the digital stamp with friends or family, or transferring the digital stamp to friends and family. *Create any products in mass production, assembly-line construction, with production by workers for hire, or by syndication of craftwork for sale. *Products such as scrapbooking supplies (digital or printed), home wares, clothing, fabric, vinyl art or decals, digitized embroidery files, electronic applications, published books, or any type of web designs, logos, letterhead, business cards or other types of identity/branding materials (pre-made or custom). *Any form of template that gives the client access to the source image of the digital stamp where it can be used on its own. *Use the digital stamps for obscene, defamatory, or immoral works or any other purpose that is prohibited by law. The Small Commercial Use License covers products that will be used to create derivative works offered for (personal use) sale. This license does not cover derivative works that are to be mass produced or sold in quantities of 1000 or more. You may use Pixel Gypsy Commercial Use products both commercially and personally, so as long as you place GRAPHIC CREDIT, with a url linking back to (http://www.thepixelgypsy.com) within your item description. This graphic credit must be placed where you are selling or using your derivative work, not on a separate page. If you do not wish to place graphic credit where you sell or use your derivative work, you have the option of purchasing a No-Credit-Required License for each product you purchase. The NCR Licenses are $20.00 per graphic set. To use Pixel Gypsy Commercial Use products, there are no exceptions - Graphic Credit must be placed, or No Credit Required License must be purchased. Without either, you are in violation of these Terms and will be contacted. * You are allowed to use Pixel Gypsy Commercial Use products for small commercial use, meaning no additional or alternative licensing is required for derivative works that aren't mass produced or that sell under 1000 copies. * You are allowed to use Pixel Gypsy Commercial Use products on your Personal blog or on a website for a client so long as the final results are displayed in a flattened .jpg/.png form and not more than 72dpi. Graphic credit is required on sites that incorporate Pixel Gypsy Commercial Use products (including websites for clients) unless a No Credit Required License is purchased. * You are NOT allowed to re-distribute the original Pixel Gypsy Commercial Use products in their original form. This means you must alter the original products to create a DERIVATIVE product. * You are NOT allowed to include Pixel Gypsy Commercial Use products as part of a graphics or clip art collection, even if not in their original form. * You are NOT allowed to turn the original Pixel Gypsy Commercial Use products or derivative designs over to any company for any reason, or sell the original or derivative designs under any type of license that allows for commercial use. *You may NOT use Pixel Gypsy Commercial Use products for the creation of digital cutting files. If you would like to purchase a Mass Production license or have any questions, you can contact me at sherrie [at] pixelgypsydesigns[dot]com. All conditions as stated above, in the Small Commercial Use License (for Clip Art), still apply for the No Credit Required version of this license, with the exception of the Credit Requirements. No credit or link back is required where using or selling a derivative product created with Pixel Gypsy Commercial Use products where an additional No Credit Required (NCR) license has been purchased for the specific Pixel Gypsy Commercial Use product being used. One NCR license must be purchased for each graphics set (sold as one product) to be used without credits. All other usage allowances and restrictions still apply. Unless otherwise specified in the listing, all products are for personal use and limited Scrap for Hire/Scrap for Others (S4H/S4O) use. My Personal/S4H/S4O license explicitly excludes all commercial, for-profit use outside of creating scrapbook pages as a service for clients. The license includes usage for projects created specifically for individual clients that includes delivery of fully completed pages delivered as flattened files. Delivery/sale of projects using copyrighted material protected under this license in a “quick page” or “template” type format to clients is strictly prohibited. If you have any questions about licensing or are interested in purchasing Mass Production/P.O.D. licensing for clip art, or commercial use licensing for scrapbooking or digital stamp products, please contact me.